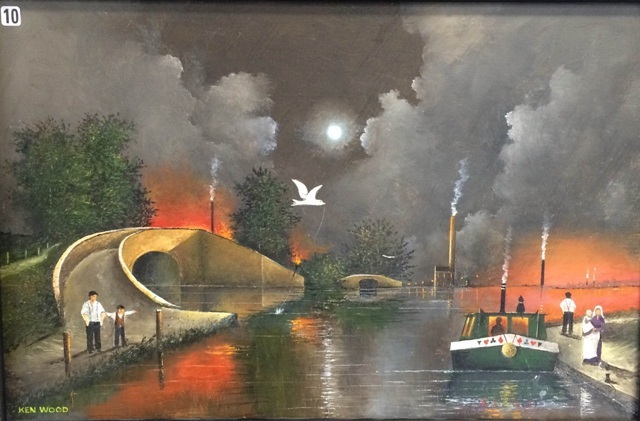 Dramatic paintings evoking the drama and atmosphere of the Black Country's industrial past are on display at one of the region's newest exhibition spaces. The artwork by Midlander Ken Wood is on display at Dudley Canal Trust's Portal building. The free exhibition features paintings inspired by local scenes, such as views of canal-side factories and local streets, as well as domestic scenes of traditional Black Country life. Ken's dramatic and vibrant palette captures the roar of the furnaces which would glow all through the night, and the thick smoggy air. Ken's works also capture the lives of workers whose incredible efforts made the area so important during the Industrial Revolution. Ken was born in Ironbridge and later moved to Dudley. At an early age he became aware of the intense labour carried out by the local people keeping industry alive in the area. His works have been exhibited widely and have even found their way to the USA and New Zealand. 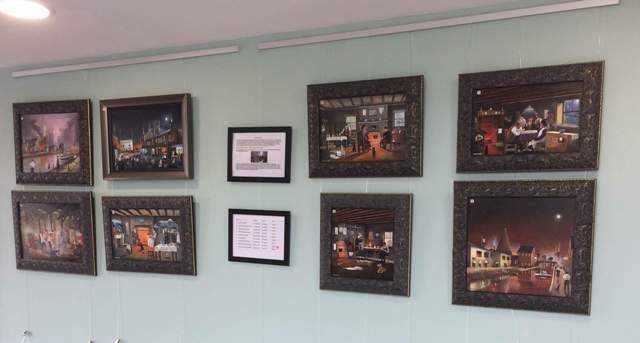 "I have exhibited my work at several venues throughout the Black Country and beyond so when I had the opportunity to show some of my paintings at the fabulously impressive building, the Dudley Canal Trust's Portal, I jumped at the opportunity," says Ken. Among the featured artworks is Red House Cone at Wordsley, a moonlit scene showing the Red House Cone, located next to the Stourbridge Canal. The Red House Cone was used for the production of glass, which Stourbridge was famous for during the Industrial Revolution. With Ken's deep red hues, the entire scene appears to be flaming in the fires of the factories. 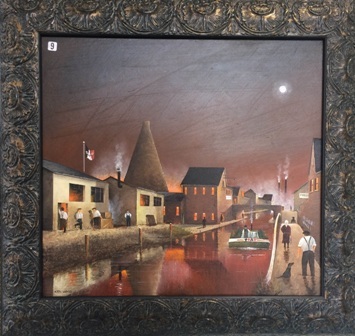 "We're delighted to be able to display Ken's work in our new temporary exhibition space," says Holly Wain, Heritage Activities Assistant at Dudley Canal Trust (Trips) Ltd. "His work is so striking and perfectly captures the atmosphere of the Black Country in years gone by." The exhibition is free to visit and runs until August 22, 2016. All the original artwork featured in the exhibition is for sale. Established in 1970, the Dudley Canal Trust was created to protect and preserve a spectacular network of underground canal tunnels carved beneath the region to mine the raw materials that powered industrial growth. Through its subsidiary charity, Dudley Canal Trust (Trips) Ltd, over 70,000 visitors each year enjoy regular guided boat trips through the tunnels, accompanied by videos, lifelike reconstructions and music and light shows. Why? Evoking memories of the Black Country's industrial past.